Well, spring is upon us in Philadelphia, and that means sunshine, warmer weather, Phillies baseball and ice cold brews. Which particular beer? Where is it located? Fear not, Phillies/beer fans, we got you covered. Welcome to our 5th Annual CBP Phillies beer locator! 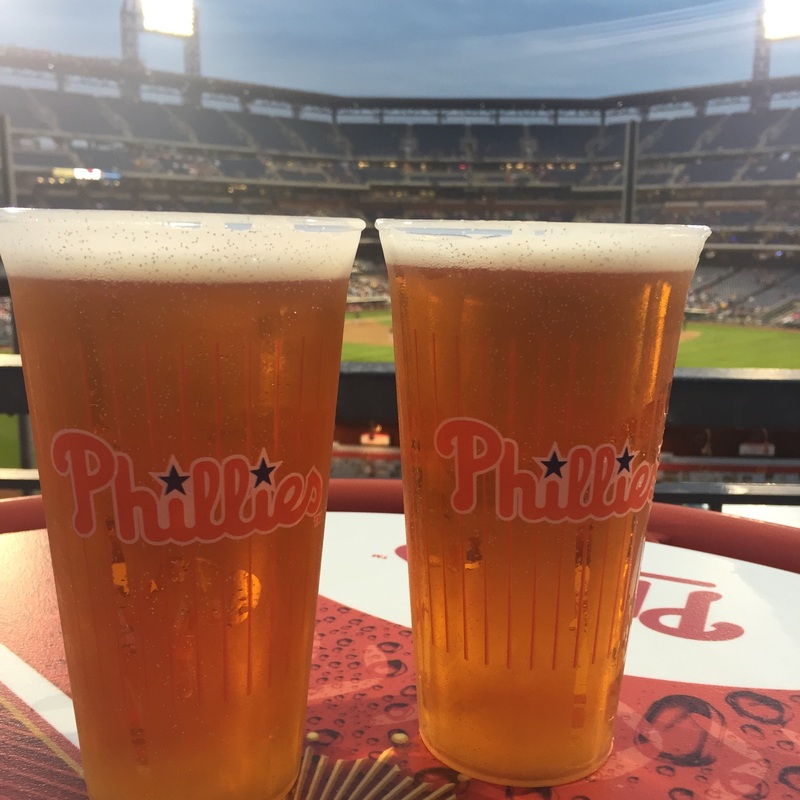 We hit the Phillies preseason exhibition series for an advanced look at this year’s ballpark beers. Here are the biggest things that caught our eye for this 2016 season: more cans, less bottles … and way less local/craft beer than ever before. Like the last couple years, you’re going to see mega cans everywhere and anywhere in 2016. Traditional 12-ounce bottles are few and far between, which means some local beers that used to dominate CBP are long gone. Over the years, we’ve seen less diversity and more and more Anheuser-Busch products – be those tradition Bud brands or their newer premium/craft brands (like Goose Island). Changes to CBP’s beer lineup throughout the season are quite common, although it is unusual to see such lack of diversity this early on. We’ll be sure to let you know of any major changes (hopefully, additions), as we update our Locator throughout the season. What does this all mean for you, the loyal Phillies/beer fan? Well, at first glance, the good news is that most of the mainstay local/craft beers from recent seasons are still available. The bad news is that these local/craft options are even more scattered in 2016, as Goose Island and Shock Top, for example, take up even more of the taps that used to host local/craft beer. If the On Deck Series was any indication, it looks like we’re back to the standard from years past, where we’ll have to race to certain Brewerytown locations and specialty kiosks to find more of a variety of beers. Local Weyerbacher is at CBP for the first time on draft that I recall, with their Last Chance IPA. New Belgium Brewing Company entered the Pennsylvania market this past year, and they are a very prevalent new addition to CBP, which is a little head-scratching since they are a Colorado brewery. There were lots of Fat Tire Amber Ale cans all over the place for the Exhibition Series, and draft options include Fat Tire, Citradelic Tangerine IPA, and Heavy Melon Watermelon Lime Ale. SweetWater Brewing Company, based out of Atlanta, Georgia, is another new addition to CBP this year. Their 420 Extra Pale Ale cans are 16-ouncers. Goose Island’s Green Line American Pale Ale is a new addition to CBP in both draft and can options. Flying Fish Brewing Company has a new offering this year: Daylights Saving Session IPA in 16-ounce cans. Local Conshohocken Brewery’s Puddlers Row ESB is back for a second year and is a great beer for when it’s cooler out. Troegs is still representing the craft can beer movement at CBP with the most powerful punch. Troegs Trogenator weighs in with an aggressive 8.2% ABV. I really enjoy sipping these 16-ounce doppelbock cans a lot during cooler games, and it’s nice to see their new can design around CBP. I really like the Sly Fox 360 IPA cans. Yes, indeed, these are the cans with the 360 Lid – the entire lid comes off, enhancing your can-drinking experience. Speaking of bars, the Alley Brewing Company in rightfield by the bullpens and Chickie & Pete’s now has a full bar available, too. In the cold, these are some of my favorites: Conshohocken Puddlers Row ESB, Goose Island IPA, Sly Fox 360 IPA (can), Troegs Troegenator (can), Victory HopDevil , Weyerbacher Last Chance IPA, and Yards Brawler. In the hot summer months, I gravitate towards these brews: PBC Walt Wit, Sly Fox Royal Weisse, SweetWater 420 Extra Pale Ale, Troegs DreamWeaver, Victory Summer Love, Yards Philly Pale Ale, and Yards Saison. In the end, beer is a personal choice. Our annual CBP Beer Locator hopes to facilitate your baseball-beverage enjoyment. We hope you enjoy our hard work and enjoy whatever beer is your personal favorite. We’ll be updating all season long. Here’s to a great 2016 Phillies season! High Hopes!